Although “non-specific” in 90% of cases, low back pain (LBP) is often treated as an independent entity, even though comorbidities are commonly associated with it. There is evidence that some LBP may be related to chronic conditions or be a symptom of poor health. The purpose of this study was to clarify the extent of comorbidities amongst a cohort of Australian adults with LBP and examine if having concurrent conditions has any association with appropriateness of care for LBP. A population-based sample of patients with one or more of 22 common conditions was recruited by telephone; consents were obtained to review their medical records. Trained surveyors extracted information from their medical records to examine the care patients received for their LBP with respect to ten indicators of appropriate care, ratified by LBP experts. Using LBP as the index condition, lists of self-reported comorbidities and those that were documented in medical records were compared. Medical records were reviewed and analysed with respect to appropriateness of care to identify any significant differences in care received between patients with LBP only and those with LBP plus comorbidities. One hundred and sixty four LBP patients were included in the analysis. Over 60% of adults with LBP in Australia had one of 17 comorbidities documented, with females being more likely than males to have comorbid conditions (63% vs 37%, p = 0.012). The more comorbidities, the poorer their reported health status (63% vs 30%, p = 0.006). Patients with comorbidities were significantly less likely to receive appropriate LBP care on nine of the ten LBP indicators (p < 0.05). This study established that the presence of comorbidities is associated with poorer care for LBP. Understanding why this is so is an important direction for future research. Further studies using a larger cohort are needed to explore the association between comorbidities and appropriateness of care for LBP, to better inform guidelines and practice in this area. Low back pain (LBP) is the leading cause of activity limitation and absence from work, with over 70% of adults experiencing it at some stage in their lives [1, 2]. LBP is the health condition that has imposed the greatest disease burden globally since 1990 . The direct costs of LBP have been estimated at AUD $4.8 billion per year in Australia . However, these are minor compared with the indirect costs, which have been estimated at over AUD $8 billion per year in Australia . Low back pain is often treated as an independent disorder with respect to the search for causes and cures. While the approach to LBP has, in recent years, moved from treating it as a purely anatomic-physiologic condition to a more complex multifaceted physical, neurochemical, biomechanical and psychosocial condition; the focus often continues to be on LBP as an isolated disorder . However, comorbidities seem to be common with LBP [7–10], indicating that at least some back problems may not be distinct entities, but one of a number of symptoms of poor health in general. In medicine, comorbidity is the presence of one or more additional diseases or disorders co-occurring with (that is, concurrent with) a primary disease or disorder and the rate of comorbidity and the number of chronic diseases experienced increases with age . In Australia, almost 1 in 3 (29%) people aged 65 and over reported having three or more chronic diseases, compared with just 2.4% of those under 45 . For a patient, comorbidities may have profound implications as the degree of physical and social disability rise with the number of co-existing conditions, which present several challenges in care [11–13]. Comorbidities are known to be associated with higher mortality and reduced quality of life and health providers need to take comorbid diseases into account when treating patients . It is also suggested that future studies on consequences of comorbidity should investigate specific disease combinations . The National German Health Survey (n = 7124) found that all 31 physical diseases investigated were more common in subjects with LBP than those without LBP and that the most common were musculoskeletal disorders like rheumatoid arthritis, osteoarthritis and osteoporosis, followed by cardiovascular and cerebrovascular disease . A Norwegian study found that LBP patients were significantly more likely to suffer from neck pain, upper back pain, pain in feet during exercise, headache, migraine, sleep problems, heat sensations, anxiety, and depression than patients without LBP . In addition to physical disorders, both episodic and chronic LBP have also been shown to be significantly associated with mental illnesses such as depression, GI disease and anxiety [6, 19, 20] and increased healthcare utilization and costs . Based on findings from the Australian Bureau of Statistic’s 2014–2015 National Health Survey (ANHS), LBP is featured in the second and third most common comorbidities in Australian adults, based on eight selected chronic diseases (i.e. arthritis, asthma, LBP, cancer, cardiovascular disease, chronic obstructive pulmonary disease, diabetes, and mental health conditions) . However, little is known about the consequences of such comorbidities with respect to appropriateness of care for LBP. any associations between comorbidities and the appropriateness of LBP care for the associated conditions in Australian adults. The CareTrack methods have been described in detail elsewhere. [22, 24] Here, we describe some aspects of particular relevance to an examination of comorbidities in the context of LBP. A sample of adults designed to be representative of the Australian population was randomly selected from a telephone directory (the Australian Telstra White Pages) from defined regions within two states New South Wales and South Australia. One adult was randomly selected from each household and recruited over the phone. Those who agreed were subsequently sent a mail package containing information about the study and a consent form to allow access to their medical records. Participants who provided consent were contacted by phone and asked if they had one or more of the 22 CareTrack conditions, and which healthcare providers they had seen for these in the years 2009 and 2010. Healthcare providers including GPs, chiropractors, physiotherapists, and specialist physicians were contacted and asked for consent for trained CareTrack surveyors to access the medical records of consenting participants. Only participants who had documented care for LBP during 2009 and 2010 were included in this analysis. Human Research Ethics Committee approval was obtained to undertake the data collection from the University of South Australia and all relevant bodies and sites. 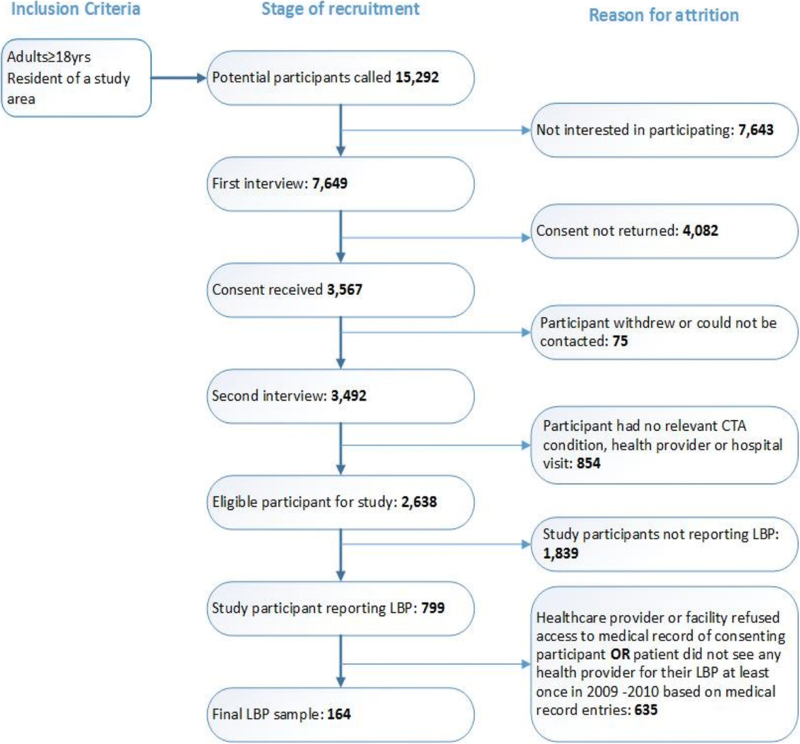 Figure 1 provides a summary of the various stages of the recruitment protocol, the inclusion criteria, and attrition at each stage to obtain the final LBP sample. Details of comorbidities in the CareTrack sample were captured in two ways. First, participants who consented to having their medical records accessed as part of CareTrack were asked to identify the conditions that they were treated for in 2009/2010 during the second phone call (see Additional file 1 for details of the question). Second, consenting participants for whom access to medical records was granted also had any relevant conditions noted (where present) from their medical records. The data obtained from both these methods are presented in this paper to identify comorbidities in the CareTrack LBP sample, however, as there were differences in the patterns found using the two methods only data from the patient records were used in the analysis for associations with socio-demographic variables and indicators of appropriateness of LBP care. The levels of comorbidity associated with LBP were collapsed to three groups: those without any comorbidities, those with one or two other conditions on the CareTrack list, and those with three or more of these. Chi-square tests were run to determine if there were any significant differences in the socio-demographic characteristics and the appropriateness of care received by these three groups of LBP patients. Significant differences were deemed to be those at the 95% level of confidence (p > 0.05). In response to the question In 2009 and 2010 have you been treated for [CareTrack condition]? 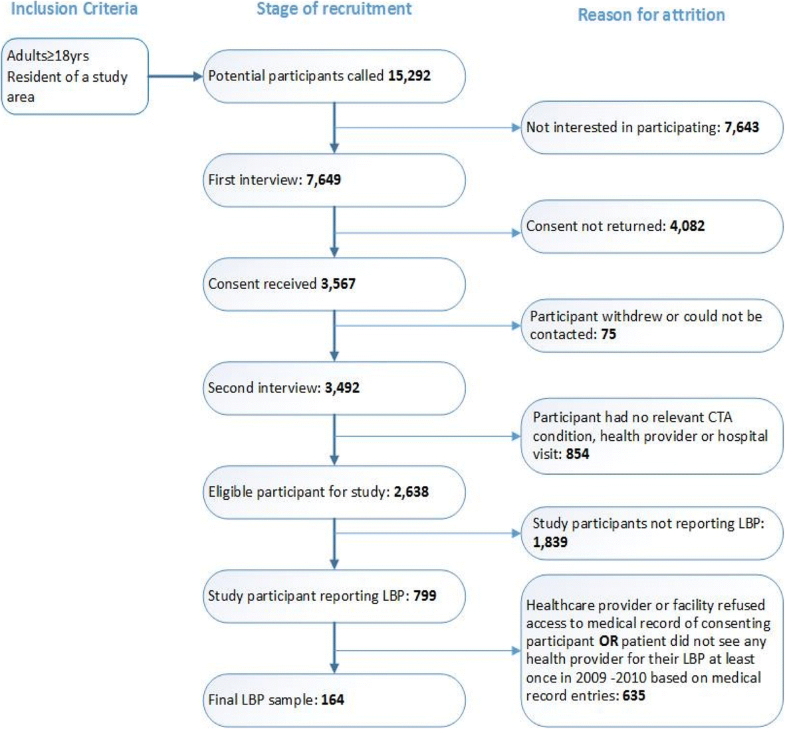 over 80% of LBP patients in the CareTrack sample reported receiving treatment in 2009–2010 for at least one of the other 17 CareTrack conditions1 during their second phone interview. Table 1 shows that the number of patient-reported conditions in the LBP CareTrack sample ranged between 1 and 10. The mean number of patient-reported conditions was 3.27 (including LBP), and the mode and median were both 3. However, in contrast, only 60% of LBP patients had been treated for at least one other CareTrack condition in the years 2009 and 2010 according to the evidence in their medical record. Thus, the level of comorbidity amongst LBP patients based on evidence in their medical record was lower than the level of comorbidity self-reported by patients. Whereas only 19% of LBP patients reported not having been treated for any of the other conditions covered by the CareTrack study, 40% were treated for only LBP in 2009–2010, based on the information in their medical records. The mean number of conditions based on medical record data was 2.46, the mode was 1 and the median was 2. The top ten specific comorbid conditions reported by LBP patients are presented in Table 2 with hypertension and hyperlipidaemia being the two most frequently reported (approximately two out of every five LBP patients reported having at least one of these conditions). Osteoarthritis and dyspepsia were the next most frequently reported conditions, with at least one in four LBP patients reporting that they had been treated for these conditions. The two most common comorbidities found in the medical records were hypertension (a condition for which approximately 29% of LBP patients had received treatment) and osteoarthritis (one in four LBP patients). For all conditions, except for obesity which was not asked of patients during their phone interview, there were far more patients who reported being treated for those conditions than there was evidence for in the medical record. Data from the medical records were used to undertake the analysis on the association between the levels of comorbidity and patient socio-demographic factors and appropriateness of LBP care. Table 3 shows the number of patients by comorbidity level and the percentage in each group based on evidence found in their medical records. Table 4 presents the data for associations between the seven socio-demographic variables included in CareTrack and the level of comorbidity of LBP patients. Asterisks indicate statistically significant differences in sociodemographic variables by level of comorbidity. Patients with no comorbidities were significantly more likely to be male than female (60% versus 40%) and those with one or more comorbidities were more likely to be female (63% versus 37%). This result indicates that in the CareTrack sample, females with LBP were more likely to have other chronic conditions than males. The second significant difference was that LBP patients who had three or more comorbidities were significantly more likely to report poor to fair health (63%) compared with those who had 1–2 other conditions (35%) and those who had LBP only (30%). Similarly, those with LBP only were significantly more likely to report very good to excellent health (37%) compared with only 11% of those with three or more comorbidities. There were no significant associations between level of comorbidity and age, educational attainment, work status, accessibility of healthcare or medical literacy. Compliance with CareTrack indicators for appropriateness of care is shown in Table 5. Analyses revealed statistically significant differences in rates of compliance by number of comorbidities for nine of the ten LBP indicators for appropriateness of care assessed as part of the CareTrack study (see Table 5). NOT advised to rest in bed. For the first six indicators, a clear pattern is evident. Patients who had been treated for one or more “other” conditions besides LBP in 2009–10 were significantly less likely to have had (i) their medical history documented, (ii) a physical or neurological examination, or (iii) assessments for infection, (iv) assessment for cancer or (v) assessment for fractures than patients who had LBP only. In addition, compared with patients with LBP only and those with fewer than three comorbidities those patients with three or more comorbid conditions were also significantly less likely to be assessed for cauda equina syndrome, more likely to be prescribed dexamethasone, other oral steroids, colchicine or antidepressants and more likely to not be advised against resting in bed. The only indicator that was not associated with comorbidity was the one relating to NOT receiving transcutaneous electrical nerve stimulation (TENS), lumbar corsets and support belts or spinal traction (p = 0.933). Understanding more about comorbidities can provide vital information for prevention, management and treatment of diseases including LBP. This study found that at least 62% of the 164 LBP patients in the CareTrack study had at least one other chronic condition. Comparisons with data from the 2014–15 ANHS  and the first German National Health Survey  are summarised in the bottom half of Table 6 (results). The CareTrack proportion of LBP sufferers with comorbidities obtained from their medical record was similar to the ANHS findings (62% versus 65%) but was significantly higher when using their survey data (81% vs 65%). In contrast, the German national study sample  had significantly higher rates of comorbidity compared with both the CareTrack medical record (62%) and survey (81%) proportions. Rather than reflect an inconsistency in the findings, these discrepancies are most likely a consequence of the different methods used in each study, as summarised in the top half of Table 6. The two most significant of these in terms of impact on comparability are: (1) the way LBP and other conditions were defined and (2) the number of conditions included in each study. Both the ANHS and the German study asked participants if they had “ever” had a range of conditions whereas the CareTrack study asked them if they had “been treated for [condition] in the years 2009/2010.” In addition, definitions of LBP ranged from having LBP within a 7-day period to having it for over 6 months. Second, the number of conditions covered by the three studies varied from eight to 31. These differences made comparability of prevalence of comorbidity problematic. In contrast, the most prevalent conditions to be associated with LBP showed similarity across all three studies, despite some definitional issues. Hypertension, osteoarthiritis and hyperlipidaemia were the three most prevalent conditions for LBP patients in the CareTrack study and the first two were also ranked top three in the other studies, confirming that LBP is most closely associated with cardiovascular and musculoskeletal conditions. Hypertension and hyperlipidaemia were also consistent with more than 23 other studies that clearly illustrate that LBP is associated with cardiovascular disease and poor health overall . A potential reason for this association may be that these diseases share some common risk factors such as physical inactivity and overweight/obesity. Together these findings support the theory by Hestbaek and colleagues  that LBP is often clustered with other conditions and poorer overall health. This clustering of conditions (with LBP as the index condition) is more prevalent amongst females, a finding consistent with the ANHS data and the German study – both found that females (with or without LBP) had significantly more health problems than their male counterparts [8, 10]. Patients with three or more comorbidities were also more likely to report poor to fair health compared with those who had 1–2 other conditions or those without comorbidities, confirming previous findings that LBP is associated with a person’s health status which would be expected to deteriorate with each additional chronic condition. Further studies should also examine continuity of care and patient satisfaction, important areas for patients with more than one disease who are likely to be treated by several healthcare providers simultaneously. Such studies can also focus on determining the nature of the relationship between LBP and other comorbidities – does LBP cause other diseases or vice versa; do these conditions simply co-exist or do they have a common cause or risk factors? The key strength of the CareTrack methods is in the random selection of patients (a population-based rather than a convenience-based sample). However, an unavoidable consequence of this strategy, compounded by limited research funds, was that the number of participants with LBP was low (n = 164), especially when compared with similar studies. The approach used was also associated with a high rate of attrition of potential participants (see Fig. 1) and several sources of potential bias, particularly in favour of recruiting older Australians. Another potential limitation is the possibility that care had been provided but was not recorded, an issue estimated to affect about 5% but no more than 10% of instances. . A final limitation is the number of conditions included in the study and confinement to conditions that were treated in 2009–10, both of which were likely to have reduced the overall level of comorbidity amongst the CareTrack LBP cohort. Within the scope of this study, it was not possible to definitively assess the accuracy of both patient self-reports and medical records. It is possible that patients may have had some of these other conditions they identified at some point in their lifetime (particularly in the period between 2010 and when they were interviewed) but not have received any treatment for them in 2009–2010, hence their absence from parts of the medical records reviewed. Equally plausible explanations for the discrepancy could be incomplete medical records and/or inaccurate patient recall. Findings from this sub-study of CareTrack data indicate that there is a moderate to high level of comorbidity amongst LBP patients in Australia and that comorbidity is more prevalent in females, consistent with previous studies. The findings also confirm prior evidence that LBP is associated with cardiovascular illness, other musculoskeletal conditions and poorer general health. The most significant finding from this study was that LBP patients with comorbidities were significantly less likely to receive appropriate care for LBP. Future studies using a larger cohort are needed to explore this association between comorbidity and appropriate care for LBP to better inform clinical guidelines and practice in this area. Some other conditions such as cancer, venous thromboembolism and surgical site infections, whilst part of the CareTrack study, were not assessed as part of the self-reporting component of the research. The authors thank the participants, healthcare providers, practice managers, medical record staff, and expert reviewers who generously gave their time and the six surveyors who undertook the medical record extraction. In particular, the authors acknowledge the work of Tamara Hooper who coordinated data collection from medical records, Natalie Hannaford who coordinated the development of the LBP indicators, Russ Redford who assisted with the coding and provided statistical advice and Claire Gardiner for assistance with Fig. 1. The authors also acknowledge the contribution of the other CareTrack Chief investigators to the overall Care-Track study including its conception: Jeffrey Braithwaite, Johanna Westbrook, and Enrico Coiera. The Australian National Health and Medical Research Council (Program Grant No 568612) funds were received in support of this work through a national competitive grant application process. The funder played no role in the design, execution or dissemination of this research. The datasets generated and/or analysed during the current study are not publicly available due to ethical consideration in relation to accessing patient medical records but may be available from Peter Hibbert (email peter.hibbert@mq.edu.au) on reasonable request. As part of her PhD, SR conceptualised the sub-study, undertook the relevant analysis and wrote the first draft of the manuscript. WR conceptualised the CareTrack study and provided critical input and direction during the conceptual phases of this sub-study. PH was the CareTrack Program Manager and data custodian who made substantial contributions to the acquisition of the data used in this manuscript, LW assisted with sourcing and reviewing the literature for the background to this paper and CM provided expert input to the interpretation of the findings. All authors reviewed several versions of the draft manuscript and approved the final version prior to submission. Ethics approval for the CareTrack study was approved by Hunter New England Local Health Network (HNE HREC Reference no: 09/12/16/5.09). Ethics approvals were also sought and obtained from the following key organisations: the University of New South Wales and the South Australian Department of Health, and subsequently by relevant HRECs across Australia, which are ACT Health, Southern Adelaide Flinders Clinical HREC, The Queen Elizabeth Hospital, TAS Health, Royal Australian College of General Practitioners and the Royal Adelaide Hospital HREC. A patient consent form was developed specifically for the study and signed by all participants, giving consent to access their medical records. Oliveira CB, Maher CG, Pinto RZ, Traeger AC, Lin C-WC, Chenot J-F, et al. Clinical practice guidelines for the management of non-specific low back pain in primary care: an updated overview. Eur Spine J. 2018. https://doi.org/10.1007/s00586-018-5673-2.